Chase Edmonds is the first Ram drafted into the NFL since John Skelton in 2010. Chase Edmonds, Fordham College at Rose Hill (FCRH) ’18, a former Fordham football standout, is taking the next step in his football career. On April 28 Edmonds was drafted by the Arizona Cardinals as the 134th overall pick of the NFL Draft in the fourth round. This makes Edmonds the first Fordham Ram drafted since John Skelton was selected by the Cardinals in the fifth round in the 2010 NFL Draft. The Cardinals invited Edmonds to a pre-draft visit, so he must have left a great impression on the team. Edmonds will be joining David Johnson, Elijhaa Penny, Victor Darius and T.J. Logan in the Arizona running back room. The Fordham product has the ability to catch passes out of the back field which is a skill becoming highly valued in running backs. He runs with the ability to make quick cuts and elude defenders. He draws comparisons to current Tennessee Titans running back, Dion Lewis, because of his running style and their similar size. During the first week in March, Edmonds participated in the NFL combine. The NFL combine is where pro football hopefuls can showcase their talents to scouts by performing in a variety of football-related drills. Overall, the former Fordham star had a great showing at the combine. In the three cone drill, he put up the best time out of all the tailbacks, with a time of 6.79 seconds. Edmonds’ time for the 20-yard shuttle – 4.07 seconds – also stood out as it was tied for the best running back time. His strong combine performance was something that definitely helped him get drafted as high as the fourth round. But, ultimately, Edmonds performance at the collegiate level is what granted him the invitation to the combine. In his career at Fordham he rushed for 5,862 yards; the fifth most in NCAA FCS history. He also recorded 67 rushing touchdowns. 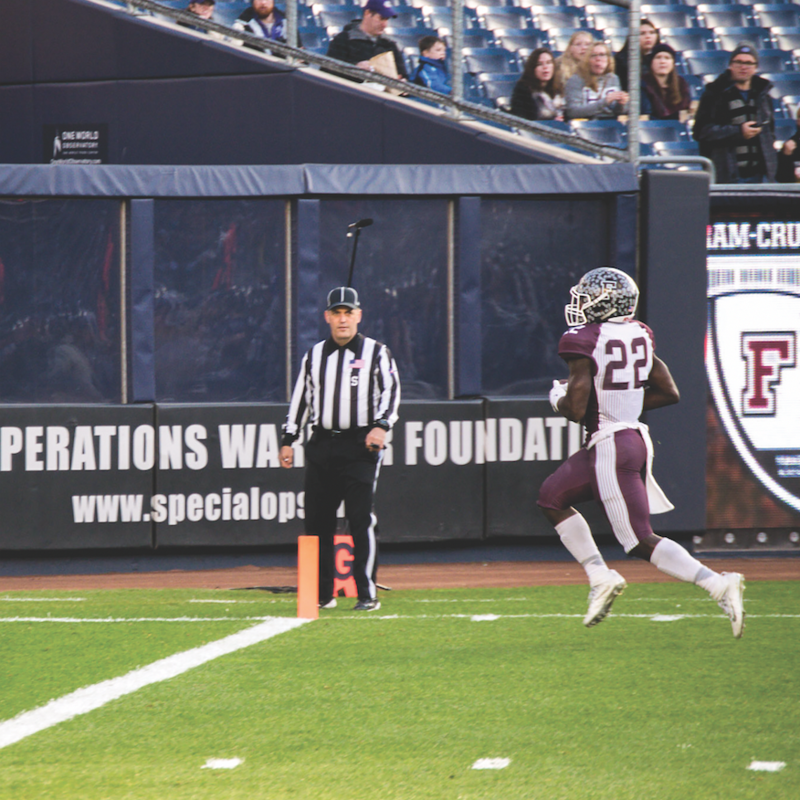 WFUV Sports staff member Emmanuel Berbari, Fordham College at Rose Hill (FCRH) ’21, said before the draft that if Edmonds gets picked it would have a big impact on the football program recruiting process going forward, because it shows recruits that they can have success at Fordham. He also believes having a big player come out of the program like Edmonds can increase the publicity the teams gets in the future. So, although Edmonds might not be physically on the field helping the Rams to victory, his legacy may be encouraging high school stars to play for Fordham.